Basil Karlo was born in Gotham City. His childhood was spent wishing to become a celebrity of some sort. Always wanting attention and often lashing out, acting out, or being overly dramatic to get it. He joined the drama club in high school and after graduation took the first train out to Hollywood where he would train to become an actor. Over the years he would rise to B-List greatness staring in several low budget films often playing the villain. Taking the role of Clayface, Basil became a legendary villain (if not in his own mind) that would be featured in a series of low budget movies; Such as, 'The Terror', 'The Terror Returns, 'The Mask of the Terror' and so on. The series drew a cult following. A few years later, a famous Hollywood producer decided to remake the original movie with a larger budget and better actors. The movie would be filmed in Gotham City to give it a more gothic background and better production value. However, Basil was not invited back to play the villain's role. This angered Basil so much that he followed the production company back to Gotham and began his reign of terror upon the cast and crew. Basil donned the mask of his quintessential villain, Clayface, and went on a killing spree. This would result in several murders including the actor that played the role of Clayface and the producer that would not give Basil the role. Foiled by caped crusaders, Basil was captured and turned over to the authorities. Being deemed mentally unstable, Basil was to be transferred to Arkham Asylum. However, it was a dark and stormy night and the fates would have it another way. In route, the ambulance taking Basil to Arkham lost control, collided with a chemical truck and both careened into the Gotham sewage reservoir. Basil was thrown from the ambulance and landed in the mix of exotic chemicals. This changed his body in horrific ways, transforming him into a claylike being that was caught up in the run-off of the sewage plant. He was washed out into the Gotham Harbor and assumed dead by authorities. This however was not the case. Basil maintained a semblance of cohesion and eventually washed upon Gotham's shore where it would take him several months to re-establish who he was and the very nature of what he was. He began to realize just what he could do and what path of revenge he would take. Basil Karlo was truly Clayface. And with a smile on his mug, he lumbered back into the Gotham Sewer where he would plot his next move. Basil has his own agenda, his own desires, his own drives. Basil does not care for anyone's feelings, desires, or considerations. He takes what he wants and it doesn't matter who he steps on to get it. He is also obsesed with his self image and knows that he is hideous, however he does not see that as a flaw, more as an inner deadly beauty allowed to be expressed. There is very little room for tact or tactics in Basil's warped mind. He is very linear in thought, direct, straight away and straight forward toward a goal. This can be used against him as he is like a juggernaut and intends to barrel through the opposition instead of using finesse. The only potential diversion type plan he may exact would be to take the form of someone else (hero/villain/famous person) to help lower the guard of his intended target. Basil is motivated by revenge upon all those who have wronged him in life. This includes, but is not limited to, the rest of the living cast and crew of the attempted remake of the original Clayface movie, the caped crusaders (of whom he is wholly unaware as to who they are so he will fire randomly at other Gotham heroes), and even his high school drama teacher who told him that he had a bright future. His warped sense of values and deluded world vision gives him a perspective that everyone has, or has the potential to wrong him, so he is intent on wronging them first unless he is given a better option. He also desires fame, fortune, and notoriety. So he may take the form of an actor/actress or otherwise famous person to get attention. Basil has no need for allies. He'd rather go it on his own and follow his own plan. If approached by another who wishes Basil's assistance or allegiance, Basil may reticently work with them only if they show him that he can significantly benefit from the partnership. This means he will be paid to play well with others. Or at least work toward a common goal that benefits him significantly. Otherwise, Basil will turn on them as soon as the opportunity presents. OOC: It's my intent as a player to establish a substantial threat to Gotham. I intend to RP as a villain and keep to my villain ways with no intention of making this character a confused hero wannabe. Basil is not one for the long con or anything that takes significant time to plan out. He's more interested in getting in, getting it done, and getting out. He has no time or patience for the extreme mechanization of some villains. Basil Karlo is not a sane man. This does not mean he's a frothing lunatic; well not always. He often has high lucid moments that allow him to think clearly. However, when he becomes angry all bets are off. He breaks down mentally into that frothing, clay slinging, dripping mess of a psychopath that would rather kill anyone in the room than to talk it out. Basil is a very moody person. It's very easy to make him angry and no one likes him when he's angry. When he gets angry, things and people get broken. Clayface is able to reform his hands into massive hammers that can (upon striking) bend solid steel. He can also make spiked balls out of his hands or will spikes to form from his body as a porcupine. These too can penetrate steel with a strike. Clayface is able to erect cages with his additional mass which and contain three regular sized humans or use his entire body as an entangle trap. Essentially pulling a target into himself and suffocating them. The strength of his cage and entangle is resistant to 10 tons of force. Since his body is completely malleable, the entangle continues to potentially envelop the target. So if the target attempts to 'swim' out of the entangle, they find themselves stuck, as if in living quicksand. Clayface is also able to move through tiny openings such as underneath or around doors, cracks in sidewalks, skeleton keyholes, down to the size of a sieve/spaghetti strainer. Clayface is able to elongate his body up to 30 feet or reach out with both arms up to 60 feet. In doing this, he loses some of his overall strength and durability in the extended limb. Therefore attacks like swords or Batarangs could chop off those parts. He uses this elongation skill to reach out and grab opponents, climb structures, and even swing hand over hand. Clayface is able to shift his appearance to resemble anyone he's seen. He is also able to change his voice to mimic the copied form. This is limited to surface/skin/clothing only. He cannot take the image of Batman and then pull off Batman's mask to reveal his secret identity. Shapeshifting also incurs the ability to reform his body into non mechanical shapes such as boxes, chairs, tables, rocks, and other geometric shapes. Both instances involves the change of color to match the original object/person. He can also take the shape of a wall, ceiling, floor, etc to lay and become a trap for when a hero comes along. Clayface is resistant to significant damage. Physical attacks are often just absorbed into his form. Blunt attacks of up to 10 tons of force will do little to him. Meaning if he was hit by a sedan doing 60 mph, it would be as if the car ran into an embankment of clay. Anything over the 10 tons of force would often dismember or splatter Clayface. As if Superman were to punch him, pieces would start flying off and away. 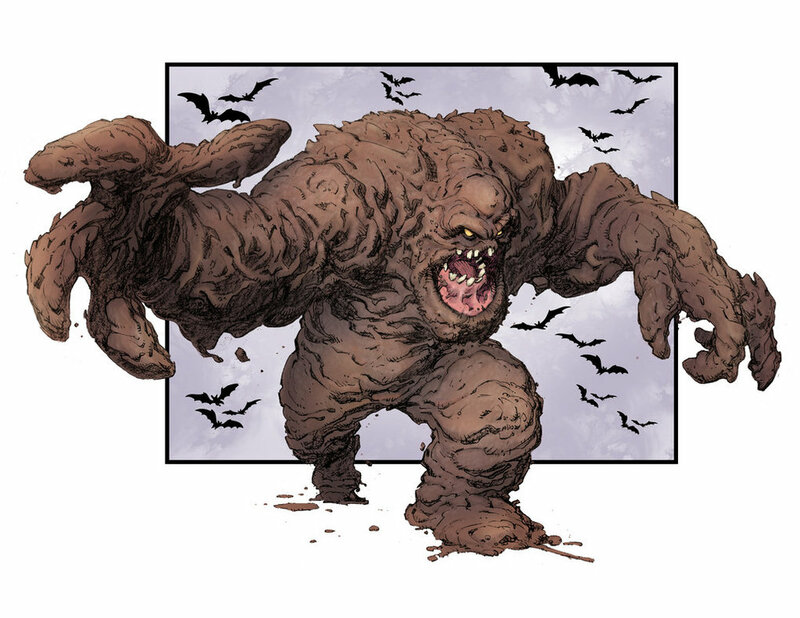 Clayface can project clay globules or spikes from his body up to 45 feet away that will strike with the force up to that of a bullet or with more mass, that of up to being hit by a cement truck. Clayface is able to transform sand and other clay into his special form. This means he is able to regenerate lost tissue/mass as well as increase his overall size to challenge stronger or larger opponents. With this he is able to increase his size to stand just over 30 feet in height therefore tripling his elongation factors. The size increase is a temporary ability and can only last up to 30 minutes. The regeneration is permanent. Clayface is able to heal up to half the damage taken in one day. Therefore, it will take him two days to heal fully any damage he's suffered. This requires a source of clay or sand and water to complete. If he is devoid those materials, he cannot regenerate. Clayface can lift 10 on average and 12 with pushing his limits tons of mass. This means he can deliver this strength in an attack or in an attempt to contain a target or push away from something/someone. See other abilities for demonstrations of said feats. Due to Clayface's desires and motivations along with his powerful and useful nature, he is the potential ally of any villain who wants to get things done. He is the quintessential 'Brawn' of any alliance. Having roamed the Gotham sewers for several months, Clayface is intimately aware of every turn and most hidden or 'lost' areas. He's very good at finding a hiding place and taking up residence. Basil is an accomplished actor. This supports his mimicry of other persons as well as gives him an advantage when presenting himself as that person. He only needs to study the habits, voice inflections, and movements of that person for a brief period to be able to adequately pull off the ruse. Acting has always been his passion and though he never rose to the A-List, he was quite good at playing the villain of the B-List. Basil holds no finesse when fighting. He is a straight forward brawler that has had some informal training. Informal in this regard is more along the lines of pretending to punch someone and pretending to take a hit. However, with his abilities, he no longer has to pretend on either count. He will wade into combat and expect to bulldoze over his opponents with grapples and bashes. Even before Basil had powers he was skilled at sneaking around. He was able to avoid detection while being a serial killer and eluded the caped crusaders a time or two. Clayface does not, nor will try to hide his identity when in Clayface form. The police and even caped crusaders will easily figure out that Clayface is Basil and vice versa. He wants the world to know who he is, his motivations (revenge) and that he himself is responsible for the death of his targets. It's a need for sensationalism and fame on his part. Certain attacks disrupt Clayface's ability to maintain cohesion. Extreme vibration (Richtor), explosive shockwaves, and strong sonic attacks (Black Canary) are a good example of these. When this occurs, Clayface will have to take time and focus to either fight the disruption, be splattered, or flee. There are certain chemical attacks that will cause Clayface to lose cohesion. Such chemicals are solvents in nature and often do splash damage. Meaning, that if those chemicals strike Clayface, he will immediately lose body material to splash or run-off equal to the volume of the chemical assault. Clayface does not have organs or any internal framework. He is an exotic form of living clay. When he takes the form of another person, or even his original identity, he does not mimic the internal nature of that presentation. This means, x-ray vision, special scans or senses, and so on would be able to detect his true nature. His scent is also unique to those with amazing noses like that of Wolverine. Heat vision, flame projection, and other heat attacks can rapidly dry out Clayface causing him to lose his ability to reform or shift. Clayface is very liquidy in nature and thus if made 'dry' he crumbles and breaks down or becomes statuesque. If he is assaulted with cold based attacks, his shifting abilities are also dampened and reduced significantly. Clayface is also vulnerable to electrical attacks. They do not necessarily do more damage, however they cause odd effects such as convulsions, tickling, erratic physical behavior, and so on. Depending on the amps and volts, the effect can be quite distracting.